The Steigenberger Hotel Bellerive au Lac is located right in the heart of Zurich and the world-famous Bahnhofstrasse, the business and bank district around Paradeplatz as well as the picturesque old town are only a 5 minute walk away. 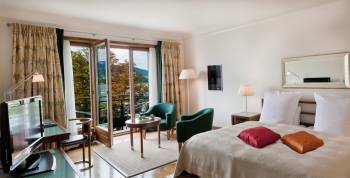 The Steigenberger Hotel Bellerive au Lac is the only 4-star superior hotel directly at the lake Zurich.Experience the magnificent interior decor of the rooms and suites renovated by the architect Tilla Theus. The successful mix of 1920s design and modern furnishings has its very own flair. The boutique hotel offers its guests an unforgettable view over the Lake Zurich.The gastronomy of our house is convincing in all respects and has something to offer for every taste. Our dishes are prepared especially for you and offer a culinary delight. An exquisite range of local, national and international wines round off our menu. With the beautiful views of Lake Zurich you will experience a unique atmosphere that is also an exclusive setting for events and receptions.For those who want to relax after a busy day, the Spa World comfort holds ready a sauna, experience shower, rest room, fitness room and solarium for our guests.